This is bright and serene color with light blue and lilac shadows.Ok purple blue collection is full of freedom and serenity. 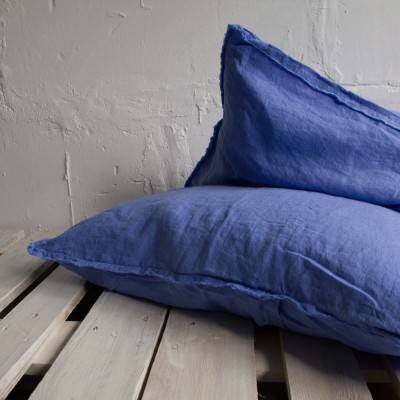 This collection in a French blue color is gently prewashed and therefore has a beautifully wrinkled texture. The true beauty of linen fabric is in its natural crumples. The shades of this collection are lilac and indigo. Fits mattress up to 18". - The fitted sheet is made with an elastic band and fits mattress up to 18"
SO soft and feels amazing to sleep on! It is a bit bigger than my queen size U.S. pillow top mattress but can easily be tucked under. I would much rather have it too big than too small. Does not compromise the functionality. I completely recommend LenokLINEN! You will not be disappointed.